Pound4Pound: Now that the Canelo and Golden Boy situation has played out for everyone to see and he has been forced to withdraw from the GGG fight what are your thoughts on the matter? 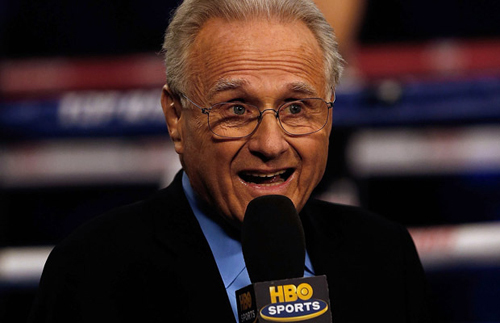 Larry Merchant: First, as a fan I am disappointed. I wanted to see the 13th round because I thought the first fight was pretty darn good, it was a very close fight. That is my basic take. Whether you believe Canelo’s story or not, that being like other Mexican athletes that got trapped with tainted Mexican meat, he is responsible. It looks as though a one year suspension will be cut in half so the fight will be rescheduled in September. P4P: I agree with you that he is responsible. Alvarez made it perfectly clear in the press conference that he was aware this problem has affected other major athletes in various sports in Mexico. My thinking is, if you knew the problem existed couldn’t you have taken some obvious precautions and stayed away from red meat while you were in training in Mexico? LM: Right! And he could afford his own ranch! P4P: That being said, it makes the tainted meat excuse very difficult to swallow. LM: Well, that’s his story and he is sticking by it, but I think that he implied in his pulling out of the fight that he takes responsibility. So I am just going to have to go with that. There have been other prestigious fighters who have failed to pass tests including Roy Jones and Floyd Mayweather and it didn’t harm their careers, but it is such a focal point today that everybody is taking out their frustrations on the guy who disappointed them. P4P: Over the past week or so press conferences were called, postponed and then rescheduled and the date of the NSAC hearing changed from April 10th to the 18th. What do you make of all the rapid fire changes that occurred surrounding the failed drug test? LM: I don’t really know. The only thing I can guesstimate is that it had something to do with the case that they presented. That in fact, they (Team Canelo) showed receipts from restaurants they ate at in Mexico. I don’t know what their (NSAC) response was. Maybe everybody was so surprised that in a big event like this, which Las Vegas depends on in a certain way, that the commission took this action. The last time I remember in a big high profile event that something like this happened in Las Vegas was when the Mike Tyson vs. Lennox Lewis fight was rejected. That fight went to another venue in Memphis. P4P: I along with a host of other boxing reporters said after the first test came back dirty that there was no way Las Vegas would pull the plug on this one, that there was just too much money involved. Soon there were rumblings that NSAC commissioner Bob Bennett took offense to those remarks and may reject the fight based on not only the evidence but spite. Do you think there is any truth to that at all? LM: I think after looking at the evidence they probably decided that the mandatory one year suspension would be reduced by half, which is not uncommon, and the fight would be rescheduled in the Fall anyway. And sometimes the stars are aligned in a certain way, the rules are the rules and government commissions that are essentially designed to help Quasi-promote whatever they are commissioning sometimes in these events come down on the right side of the rules instead of finding other ways. I thought that they would find some other way to penalize Canelo, whether it was financial or suspension after the fight. But I think at the end of the day they did the right thing and the commission should be saluted for that. P4P: It appears the show will go on and GGG will face someone that night on HBO PPV at the MGM Grand Arena. What do you think they chances for a successful show will be now? LM: You don’t salvage that event! Canelo is the Heavyweight Champion of the box office, without him there is not much of a box office to be spoken of. Will Golovkin make enough money to make it worthwhile? Probably! Does it have to be a real opponent? I would hope so. I am certainly not going to buy the event if he is fighting someone who can’t even be remotely competitive. That’s up to Golovkin and his promoters on how they can do that. If that’s the best they can do then so be it. It will keep him active and give him a platform to continue ranting against Canelo. And so it goes. P4P: Do you think at the end of the day both sides will be able to stay at the negotiating table and barring Alvarez eating more tainted red meat at another restaurant in Mexico make this blockbuster happen this September or next May? LM: I think it’s going to happen in September. Maybe this controversy will even help the fight. I am curious to see the reception that Canelo gets, a lot might change. I don’t have a crystal ball. I never did. I am just looking at what makes sense under the current conditions. If we can recall how long Pacquiao and Mayweather took until it happened, and that seemed to enhance the promotion when it did happen. So I think they will still get together. It makes economic sense and it makes competitive sense after the first fight. We all will just have to delay our gratification. Pound4Pound thanks Larry Merchant for taking our interview request. This entry was posted on Thursday, April 5th, 2018 at 4:28 am	and is filed under Boxing. You can follow any responses to this entry through the RSS 2.0 feed. Both comments and pings are currently closed.